Our picture shows a silvery Martian saucer turning gracefully in the sky over Ealing. 'I have never seen anything like it before,' said 47-yr-old bachelor Wyn Goldcrest who snapped the picture. 'One minute I was staring out of the window looking for migratory duck formations, and the next - there if was. It must have been about fifty metres across and moved without making any sound at all. Later it flashed off into the sky at an amazing speed. In the past I have snapped one or two of the alien craft, but this is the first time I have obtained a clear picture. I believe they have tuned in to my brain waves and will return.' Mr Goldcrest, a dealer in latex materials, is an ardent flying- saucer enthusiast. Some years ago he was involved in the Hyde Park Landing controversy. The mystery of the three saucer- shaped depressions in the turf has never been cleared up. Mr Goldcrest, who discovered them whilst taking a stroll one morning, insists to this day that they were left behind after a scout ship from Mars landed to leave behind messages to benefit the world. A park keeper who inspected them told our reporter at the time that they looked like a piece of digging with a trowel, and he was certain the soil on tire concrete path near the Serpentine swimming area showed where it had been dumped. 'That was just a decoy,' explained Mr Goldcrest. Mrs Edith Lemming, thirty-two-year-old former artist's model from Glasgow, was surprised to see a translucent, silvery flying saucer appear over her house last weekend. 'It made a kind of whirring noise,' she told our reporter at her home in Inverkochie Mansions, 'and then flew over the house' and vanished.' She described it as 'pulsating,' rather like a glowing pedestrian- crossing beacon. Mrs Lemming, who was separated from her cat-breeder husband two years ago, took a picture of the saucer with a box camera before it vanished. 'I'm afraid the focus isn't very good,' she explained, 'but I am not used to this camera yet as I only bought it last month to take some studies of pottery. Edith Lemmiing hopes to have the photograph reproduced as a postcard for sale in local shops. 'It would sell like a bomb, don't you think?' she said. 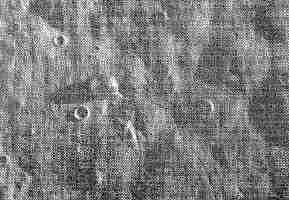 In an amazing shot of the Moon's surface, taken through a home-made telescope, nineteen-year-old student nurse Desmond Wilberforce claims to have discovered evidence that flying saucers visit the Moon. 'A circular saucer-shaped reconnaisance craft was seen on the Moon last Wednesday at I730 hrs. It was photographed through the special lens of my XLY Russian camera,' he stated today. The picture pi. 20 shows the typically cratered surface of the Moon. 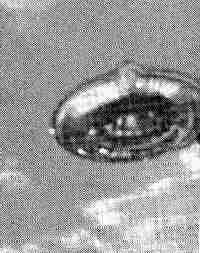 On the silvery saucer that is clearly visible near the centre is a raised central portion which Desmond claims is the control module. A series of tracks running away from the craft shows the path taken by exploratory mobile units that left the saucer for survey work, he says. On August 18th, schoolboy Dafydd Williams took a photo of this strange object in the sky hear his home. 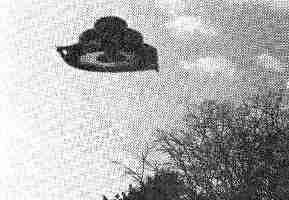 Flying-saucer experts believe it to be a picture of a new type of Unidentified Flying Object, or UFO, perhaps from the planet Pluto. Fourteen-year-old Dafydd, who was walking with some friends near Langland Bay in the afternoon, described how the object appeared 'as though from nowhere' in the sky. He quickly took a picture before it flashed out to sea over the Mumbles. He told our reporter that he had no special interest in flying saucers, though he had read some books about the subject. He thought some of the accounts were odd, and claims that some pictures of flying saucers in them are forgeries. 'It is only now that I have seen this one for myself that I know they exist,' he added. 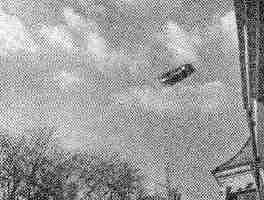 A local flying-saucer expert, who cannot be named for professional reasons, states that the picture is clearly genuine and shows a new type of long-distance ship. It possibly comes from the planet Pluto, he stated. A police spokesman said yesterday that no reports had been received of any such object, though there was no reason to believe the photograph was tampered with in any way. James Q Everett Jun, of Stockton, Calif, today claims to have photographed 'moving lights' in the vicinity of the Moon. Mr. Everett, who is an amateur astronomer, snapped the moonship in late October, but did not release the picture earlier 'for fear of ridicule.' 'I have only recently acquired a telescope and new camera,' he stated,'and shortly after commencing observations one evening I observed the formation. In my haste I did not note the settings on the camera, which I was not accustomed to. The formation is similar to those that have been reported by other astronomers in the past.' Picture editor, Ed Dirkset, states there is 'no reason to doubt the authenticity' of the Everett snapshot. NASA Officials have requested copies of the picture but claim no similar sightings were made on the night in question. In recent years there have been persistent reports that government agencies have been hushing up reports for fear of provoking worldwide panic. States Everett: 'There have been many reports that UFO travellers are due to visit earth. Perhaps the formation I photoed is in preparation for a visit, or invasion.' Pentagon officials refused to comment today. Meanwhile renewed watch is being kept on the Moon from throughout the delta area. Finally, to see how the pictures were made, click here.